1U VCA module: what features? If we made a VCA in 1U, what are the essential features you would like to have on it? Keep in mind we would like to try and keep each 1U module as small as possible. For example we could make a full featured dual VCA like the uVCA but in 1U specs this would be a quite massive module and therefore not the best idea. It is also an opportunity to do something a little different than we would in 3U. The smallest module would be single or dual linear VCA with only jacks and no bias knob or attenuator. One feature I would definitely discount immediately is lin vs. log. I think it is better to leave these as linear only VCAs. A bigger debate would be whether or not to include both CV attenuator and bias/level knob. Any feedback greatly appreciated! We will definitely make a VCA module if we can get a good consensus on desired features. 1U stereo vca? yes pls. otherwise…in the modular spirit of things, dig the idea of it basically being 1/2 of a µVCA, especially if it would keep the price down, so if people wanted to grab a couple, it wouldn’t break the bank. i would personally want cv att AND bias, but i can see the advantage of jack only, both from a cost and space pov. I think this is a great idea, however would encourage the implementation of an attenuator. It removes the need to redirect the signal through an attenuator prior. Even with 9mm pots, that is better than none. I’d be perfectly happy with a couple of linear VCAs. In, CV, Out. No knobs. Seems like that could fit in the space of one of the current mults, or less. I wouldn’t mind using 3U for something fancier. I’d grab a couple of those! In, CV, Out. No knobs. If its a 2 channel VCA controlled with one source , then have a little switch to invert the CV of channel 2 to create ducking effects or VC crossfade 2 signals. In my opinion every linear VCA should just be a crossfader, cuz every VCA is already a crippled crossfader, crippled in the sense that you can only crossfade with silence ie:turn the signal down. being able to have control over what that “silence” is, is a good simple feature. Another vote for no knobs from me. Smaller the better, let Quadratt do the CV heavy lifting. My primary request is that it should be possible to fully open the VCA with a 5V signal, and provide an attenuator to tame/limit hot control signals. This would allow more control sources to affect the entire range of the VCA. Quite a few of the basic VCAs on the market require 10V to fully open, so if one is using e.g. a Doepfer type EG (0-8V) then it’s not possible to fully open the VCA unless some amplification is used to boost the EG output, which frankly is a bit naff. One more vote for no knobs! And stereo for sure. A few of those would save a lot of rack space. I’m sure it’s impossible, but if you all did a LPG/VCA, I’d be so happy. Switch for LPG/VCA, CV in, IN, OUT, and LEVEL knob…or no knob but input is unity with nothing plugged into the input. The Stereo VCA with shared controls would be fantastic. I’m pretty sure an Intellijel LPG would break the internet. Also a fan of how the vcas are implemented in IFM Denum/Dunst. 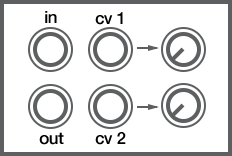 Two vcas and the difference between the modulation voltage on each channel decides which output and how much gain per output.